The achilles tendon is the strongest tendon in the body. Read on to see what can happen when it truly becomes your achilles heel. The achilles tendon is the strongest tendon in the body, in charge of pushing off during the gait (walking) cycle. This tendon is used for thousands of steps daily and can incur a variety of injuries, the most severe of which is referred to as an achilles tendon rupture. For some, this injury occurs following many months or years of pain due to achilles tendonitis while others seem to come without any warning. Achilles tendinitis describes a common condition that causes pain in the back of the lower leg/heel area. It is often a result of overuse as well as a limited amount of flexibility of the tendon. Inflammation of the tendon causes pain and in addition to addressing the inflammation, the mechanical cause of the tendonitis needs to be addressed. This means that often times a brace, anti-inflammatories and stretching are utilized to restore the tendon to improved health. The most common scenario resulting in rupture of an achilles tendon is when men in their middle-aged years participate in athletic activities. In many cases, these patients admit that overall they do not have regular exercise they participate in but when invited by friends to play a game of flag football or basketball, they grab for their gym shoes and head to the field (or court). The injury typically occurs when pivoting off of the foot to pass or catch the ball. It can even occur when golfing, if a particular force is applied with the foot in a pivoted position it can cause rupture of the tendon. Common symptoms a patient will describe when an achilles tendon rupture occurs is that they felt a sudden onset of weakness, a feeling that their heel was sinking into the ground or that their foot was on an incline that they didn’t know was there. Feeling or hearing a pop of some sorts is not uncommon, though pain surprisingly is not the primary complaint. Also surprisingly, many patients are able to get back up and walk (albeit limping) to get somewhere for help. The reason for this is that there are other tendons that serve similar functions to the achilles tendon that cross the ankle joint, which means that these tendons will help allow some amount of mobility after an achilles tendon injury. An injury to this tendon can result after repeated bouts of achilles tendonitis, which if left untreated results the in development of scar tissue within the tendon. Scar tissue undergoes a process whereby it remodels to be a more functional type, but this tissue is more brittle than innate healthy tendon. A healthy achilles tendon is more elastic and resilient. As stated earlier, achilles tendonitis does not always preclude a rupture injury of the tendon. Sometimes, just the position of the foot and the forces on the tendon exceed what it is capable of supporting and then the tendon will rupture in its weakest area. In terms of anatomy, the achilles tendon begins at the base of the calf which is a combination of the gastrocnemius and soleus muscles. The tendon inserts to the back of the heel bone. A portion of the achilles tendon is referred to as the ‘watershed area.’ This area is approximately 4-6 centimeters above where the achilles tendon inserts on the heel bone. It is called the watershed area because this is the area most commonly affected by achilles tendon rupture. It is believed that this area corresponds to where there is the lowest amount of blood flow to the tendon. The tendon itself gets blood flow from the muscles above it, the outer lining of the heel bone it attaches to and a tissue called the peritenon which surrounds the tendon and helps allow it to glide and function normally. 4-6 centimeters above the heel bone is about ½ way between the blood flow the tendon would get from the heel bone and that which it would get from the muscle above. When a patient suffers a rupture to their achilles tendon, the treatment is based upon the severity of the injury as well as the age and health of the patient. For young and/or athletic patients, surgical repair of the tendon is highly recommended as it has been found to facilitate faster healing as well as a decreased risk of re-rupture later in life. Surgical repair of a ruptured tendon can either be performed through a traditional open incision or through multiple small incisions. There is special suturing material that is used which is not absorbable by the body. This means that the suture will be responsible for assisting in transferring the load through the achilles tendon during the healing process and may even assist in this after the tendon has fully healed. If a patient is older or has a more complicated medical history, casting to immobilize the tendon and allow it to heal on its own may be recommended. 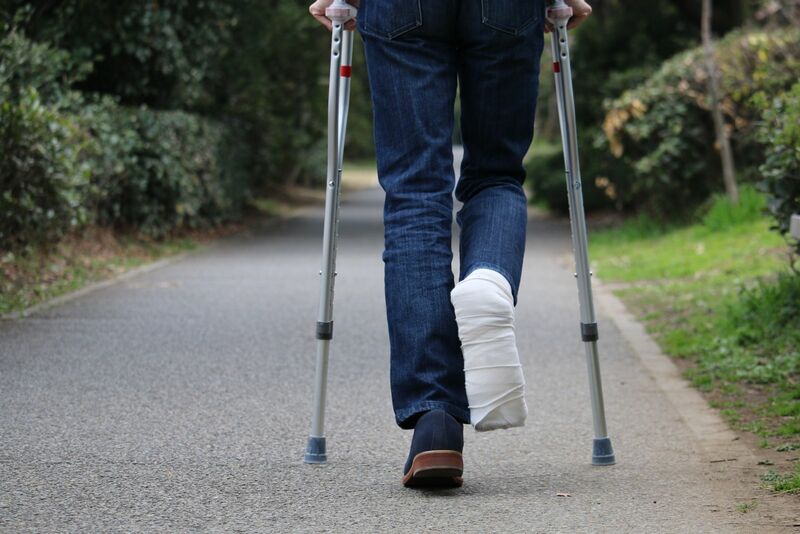 Typically, the cast is applied initially with the foot in a resting position as this will naturally bring the two ends of the tendon closer together, reducing the distance that the body has to heal over. The casts are changed every 2 weeks and when appropriate, the foot will slowly be casted in a position closer to 90 degrees to the ankle, which aids in allowing the tendon to stretch to a functional length. The healing rate for a torn or ruptured tendon is approximately 6-8 weeks. For this reason, casting from injury or following surgery may be recommended for this full length of time. After this period of time, physical therapy is of the utmost importance. Physical therapy helps to facilitate remodeling and stretching of the tendon. It also assists in re-training the muscles and tendons in the leg on how to walk properly again. Strengthening and stretching the tendon in a well-controlled manner reduces the risk of re-rupture later in life. Pain in the achilles tendon isn’t something that should be ignored. When you have pain, your body is telling you to slow down and to pay attention to what hurts. If you have pain in your achilles tendon that doesn’t resolve with icing and rest over the course of a few days, evaluation is recommended. A simple case of early achilles tendonitis is much more manageable than a tendon rupture and this condition has a greater likelihood of causing later damage if treated promptly. Call our office if you have pain in the back of your heel or if you have suffered what you think may be an achilles tendon rupture!